Current literature defines the effective capacity of a wireless link as the maximum throughput that can be supported while meeting specific Quality of Service targets on packet delay. This metric can be harnessed for a wide variety of QoS control routines within wireless networks such as traffic optimisation and delay sensitive admission control and routing. However to date, no empirical evaluation of the effective capacity of 802.11 wireless links has been carried out. We present an empirical study of the effective capacity throughput of 802.11 wireless links under a number of network scenarios. We evaluate an analytical effective capacity model and compare the result with an empirical evaluation. We find that with an accurate measurement of the channel service delay, the effective capacity model can approximate the empirical measurement quite well. We also evaluate the relationship between the effective bandwidth of multimedia traffic and demonstrate that when the effective bandwidth exceeds the effective capacity threshold of a wireless link, the probability of QoS violations increases. We conclude that the effective capacity measurement is usable within an operational setting, and can lead to optimized utilization of bandwidth in a wide range of delay sensitive control operations. Davy, A.; Meskill, B.; Domingo, J. 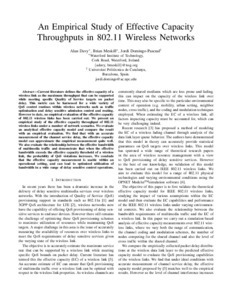 An empirical study of effective capacity throughputs in 802.11 wireless networks. A: IEEE Global Communications Conference. "2012 IEEE Global Communications Conference (GLOBECOM 2012): 3--7 December 2012, Anaheim, CA, USA". Anaheim, California: Institute of Electrical and Electronics Engineers (IEEE), 2012, p. 1770-1775.